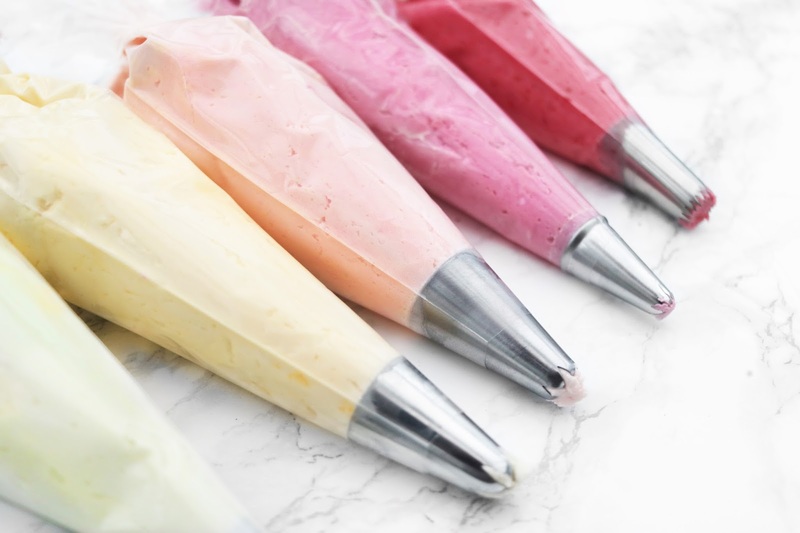 I wanted to share this recipe with you guys as I have had trouble in the past colouring buttercream frosting. I now have the perfect recipe which works every time and creates thick, colourful buttercream which hardens when at room temperature. I always use my bakery styled vegan buttercream, which is light, fluffy and utterly moorish! It's a pleasure to pipe and always looks stunning, and tastes divine! The trick is to go slow and take your time. You can always add in moisture but you can't take it out! Step 1- Start with a fresh batch of my delicious vegan 'buttercream' Get the recipe here. Step 2- Separate the buttercream into different bowls. I like to use four. Step 3- Add a 1/4 teaspoon of vanilla flavouring to the buttercream along with a few drops of colour. Mix with a metal spoon until your desired colour. If you do add too much liquid, add more icing sugar. This will help stiffen it up again. Step 4- Add your frosting into piping bags fitted with nossels (I like to use open star tips from Wilton) and pipe away! You can also naturally colour buttercream with compote, as seen on my vegan macaroons. Best used fresh, or store in the fridge.